Are you a nut lover? If so, you’re going to LOVE our giveaway today—JUSTIN’S NUT BUTTERS!!! 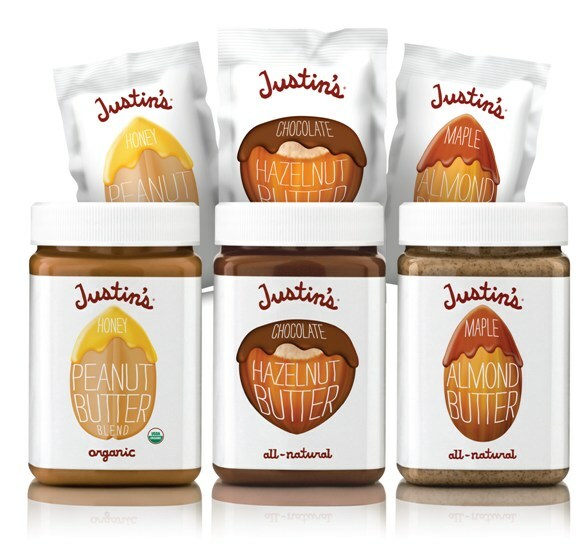 Justin’s makes a variety of All-Natural Peanut, Almond and Hazelnut butters in ridiculously delicious (I say sinful!) flavors like Chocolate Hazelnut (like Nutella…but better), Chocolate Almond and Honey Peanut. You’ve probably seen Justin’s single-serving packets (about 1 oz) in the supermarket. They’re perfect for traveling, to bring to work or school or, if you’re like me, to keep you from eating half the jar standing in front of the fridge with a spoon in hand. However, you can also get Justin’s in 16-ounce jars. All of their products are naturally gluten-free, have no trans fats or hydrogenated oils and are certified kosher. As a dietitian, I’m nuts for butters because they are a good source of plant-based protein and are rich in the healthier unsaturated fats—monos and polys—while being lower in saturated fat, the type that clogs and cinches your arteries. Try pairing Justin’s nut butters with other healthy options like bananas, apples, celery and always whole-grain breads or crackers. Five lucky readers today will win more than a month’s supply of Justin’s nut butters, including all of their flavors, in packets and jars. To enter, tell us which flavor of Justin’s Nut Butters you want to try most. You also need to “Like” AppetiteforHealth on Facebook and sign up for our newsletter on AppforHealth.com (located on right side-bar). Tough one… tie between maple almond and honey peanut for me!! Haha I saw your tweet… AND I mean business when it come to Justin’s Nut Butter!! 🙂 It is so yummy. I would love to try the Chocolate Hazelnut Butter! Hmm…That maple almond butter is calling my name! I love the hazelnut. I would really love to try the maple almond. I would et that the combination is delightful. I’m interested in trying both the Hazelnut and the Almond Butter…. I’m sure they are both very tasty! Ooooo! I want to try the maple almond ’cause I can not eat peanuts and get real tired of cheese sandwiches. Well, I love the chocolate hazelnut. I would really love to try the maple almond. I would bet that the combination is delightful. I think it would be awesome with apple slices. I think I should try all three to be fair. Then I can tell the whole world which is best. I definitely want to try Chocolate Hazelnut 🙂 I like AppetiteforHealth on facebook and subscribe to your newsletter as well. I Would love to try the Honey Peanut Butter Flavor! I’m signed up for the newsletter. Wasn’t sure if I needed to post that, but better safe than sorry. I would love to try the Chocolate Hazelnut… I like Nutella, but would prefer something a bit more natural – perhaps this is just the thing! I also subscribe to your e-mail. I can’t decide…ALL of them! I love chocolate hazelnut spread, but I am VERY intrigued by the Maple Almond!!!! It sounds delicious and like nothing I have had before!!!! YUM! I’d love to try the Peanut Butter the most! I’m also a Facebook fan, and email subscriber. Thanks! I would love to try these products. What is better than chocolate and hazelnut? Yummm, but Maple Alond sounds so creamy and delicious!!! Chocolate hazelnut all the way! Ooooh! You are going to make me choose huh?….Well, despite the fact that I will eventually try every last one of them, I would choose the Maple Almond Butter as my first choice as it sounds unusual and scrumptious! Honey Peanut Butter – YUM!! I like you on facebook, subscribe to the newsletter and NEED to try the chocolate hazelnut butter. I would love to try the Chocolate Almond and the Chocolate Peanut flavors. Both sound heavenly and healthy. It’s great that these products are made gluten free also. They all sound delish, but I think that maple almond would be my first choice! i really, really want to try maple almond butter! The maple almond butter sounds pretty tasty! Chocolate, definitely! Chocolate and peanut butter….2 of my favorite flavors. They all sound yummy but i will try choc. almond. I would have to say chocolate hazelnut, brcause one I think it is the greatest combination ever( besides chocolate and peanut butter) but two, I am just a chocolate nut, hahaha! All the butters sound awesome but as far as favorites go, hazelnut is by far the one I love most. I would like to try Chocolate Almond, two of my favorites. i would like to try the almond butter please. I want to try them all. I love chocolate hazelnut …..but they all sound delicious! They all sound great! I think I would pick maple almond butter first. I “like” Appetite for Health and get the newsletter. Thanks! I would love to try the Justin’s Chocolate Almond Nut Butter please……I love nuts! MMM…hard to choose, they all sound great…but I guess the chocolate almond would be the first jar I would open! My youngest’s name is Justin – so I’d love to pack some of the individual packs in his lunch…I could see him making a BIG DEAL out of it at school! I already like you on FB and signed up for the e-newsletters! I love the idea of individual packets. But I would love to try the Chocolate Almond Butter. I think that would be awesome with some raspberry jam!!! I really would like to try Hazelnut Butter. I follow you on Facebook and I signed up for your Newsletter. Thanks. I would like to try the honey peanut. I think it would taste so yummy with a granny smith apple! I lovee<3 Justin's!! This really excites me to have a thought I could win a whole month of Justin's Maple Almond butter!!! I love spreading it on a carmel rice cake and eat away, it's my new founded love in life! Justin's just Rocks it! I’d most like to try the honey. I want to try the honey peanut butter- way healthier than the Peter Pan kind! I love Justin’s! I love Justin’s. Seriously, I eat it by the spoonful, and its really bad when I get the chocolate almond flavor because that’s gone within a week… or less. I usually don’t share it, either. But, if I win a month supply, which will be like a week’s supply for me, I’d love to have the Maple Almond! I would be honored to try the chocolate peanut butter. Anything with the words chocolate and peanut gets me hooked! I have to say my favorite is maple almond, but I think honey almond and chocolate peanut are to die for as well. I can only get them one place (and only two different flavors) within a 60 mile or so radius, so winning this would be excellent! Chocolate Almond sounds awesome! I like you on FB and get your newsletter! I love Justin’s Maple Almond Butter!!!! However Chocolate Almond sounds super and I would love to try that!!! I have used the Maple Almond Better for Paleo Pancakes and they were hands down the best!!! Maple almond butter is my favorite, but I haven’t tried the chocolate hazelnut…delish!! I’m nuts (ha ha) about Justin’s maple almond butter, so I’d love to give Chocolate Almond butter a go! I would MOST like to try the Justin’s Maple Almond butter. This sounds like SUCH an fantastic combination. I think a big spoonful of the maple almond butter in a bowl of oatmeal would not only be VERY tasty but quite healthy! The chocolate hazelnut sounds amazing! My favorite Justin’s flavor is the Maple Almond Butter and I have to admit I have never tried the peanut butter but I have tried the Hazelnut Chocolate. Delicious! I tend to eat the Maple Almond Butter right out of the jar with a spoon, so good. I’d love to try the chocolate almond because I’ve never seen it anywhere…but all the ones I’ve tried so far are AMAZING!! I’d love the chocolate hazelnut (or any really)!! chocolate hazelnut!! Is there anything better? I would like to try them all, especially the Choco Hazelnut. Fell in love with nutella until I read that they are artificially flavoured. My absolute favorite is maple almond butter but I have yet to try the chocolate hazelnut butter! Sounds delish! I’m so excited to get healthy recipes in my Inbox from you guys! I also liked you on FB. Justin’s Chocolate Hazelnut is my favorite. Nutella is too sweet for me, but Justin has it just right! Maple Almond – Introduced by Starbucks…stocked up while I lived in Houston but sadly it’s been too long since I have had any Justin’s. So long that there are many, many more flavors I would LOVE to try! Honey Peanut is my fave – bu they are ALL good! Totally LOVE Justin! They all look AMAZING, but there is no question: Maple Peanut Butter. It sounds AMAZING. If I didn’t think I would blow up my kitchen, I would try to make it at home! Help me save my kitchen and let me win the nut butter! I “like” you on Facebook and signed up for the newsletter here. Though I keep meaning to try their other flavors, I am so obsessed with their amazingly delicious maple almond butter that I have not yet ventured beyond it. So I’m sure that all of the other flavors are equally delightful and I would be happy to try any of them! I love the chocolate hazelnut butter, but I would also like to try the maple almond and honey peanut. Yum! I wanna try ’em all!! de-lish!! I would love to try the maple almond butter. I’m sure it tastes like delicious mapley goodness! I would love to try the chocolate hazelnut. I have already fallen on love with honey almond butter. I use this as a protein boost after climbing. Love it!!! chocolate hazelnut! Better than nutella! I’d like to try chocolate almond and honey peanut. mmmm! I would love to try Maple Almond! I already love the chocolate almond and maple almond. I would try honey almond again. LOVE the almond butters! I would like to try Chocolate Hazelnut! It sounds absolutely delicious fantastic! YUM! My personal favourite is the chocolate hazelnut PB!!! Y.U.M!!!! I love the chocolate nut butters, the hazelnut one is much better than Nutella! I would love to try the maple almond butter next. Without a doubt, Maple Almond is the one. It is a perfect balance of flavors with beautiful texture. I want to try the maple almond butter! Call me a virgin but I didn’t even know about other flavors!! Hooked on honey peanut butter…SOOO good! I would have to go with the chocolate almond butter. My two all time favs in one amazing jar of awesomeness!!! I really like these new companies like Justin’s Nut Butter. Things like these is what this country needs!! most definitely the maple almond! i love the honey peanut butter but chocolate almond sounds like something I would eat straight out of the jar. yum. I bet the chocolate Peanut butter is the way to go. I would sure like to try that one! The store near us only has the chocolate hazlenut butter, so I tried it. It is SO MUCH BETTER than Nutella – and I know that it’s so much better for me. I’ve dedicated myself this week to starting a new diet, but this one will be for life. Lots of veg, lots of lean meat, and try to keep the carbs reasonable. Good thing about Justins is that its all natural, so when compared to something like JIF, the carbs are no where near as bad for me. So I can still enjoy my PB 🙂 even if its made with hazlenuts or almonds. I need to compare Nutella to your Hazelnut flavor. For several weeks, cause I’m sure it will be too close to call. Yum. I really want to try the chocolate hazelnut butter! Yum! Kelly–because it was your B-Day….Happy B-day! Well I am already completely in love with the Maple Almond Butter (read my blog about it here: http://tinyurl.com/4fnvbrd), and quite like the Honey Almond Butter as well, but I’m as curious as anyone about the Chocolate Hazelnut and Chocolate Almond. Maple Almond Butter FOR SURE!